Amongst Vogue’s stable of regular contributors was designer of this cover of March 1939, Eduardo Benito (1891-1981). Benito, a Spanish illustrator and painter, lived and trained in Paris from 1912, and the style of his many Vogue covers from 1921 was indebted to the artistic milieu in which he worked. Those from the 1920s were strongly influenced by the elongated figures, simplified features and flat planes of artist Amedeo Modigliani; by the following decade his looser, sparer, more painterly style continued to produce images of great impact. 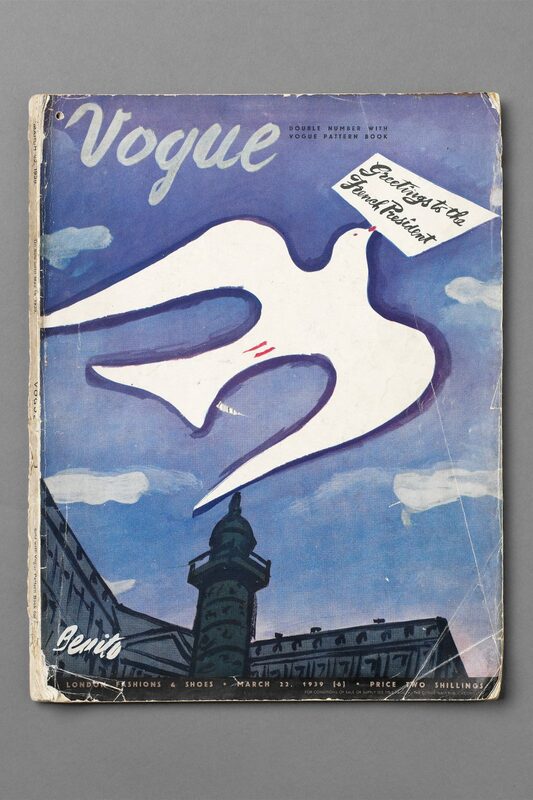 This cover of March 1939 depicts a dove flying over the Place Vendôme in Paris, the location of many of the city’s top fashion houses. 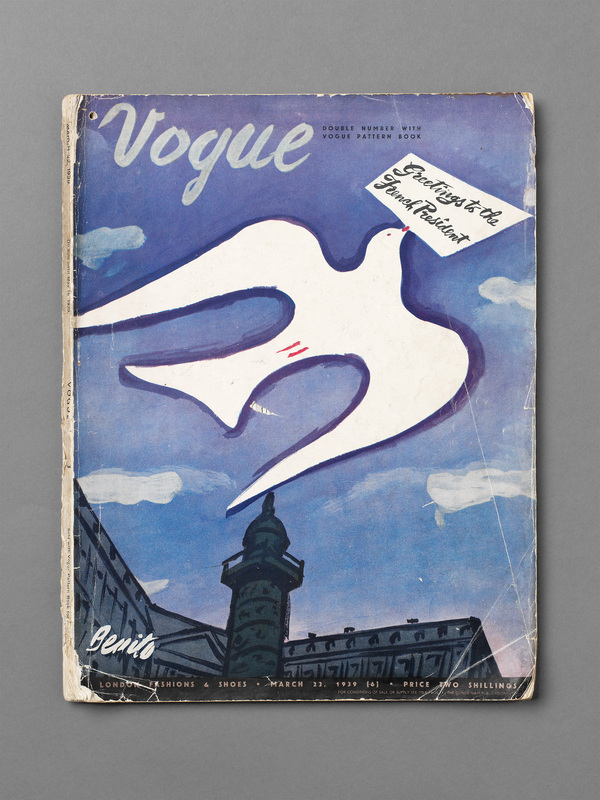 The design was used simultaneously for British and American Vogue, the dove carrying the message ‘Paris Openings II’ in red on the latter. British Vogue’s version celebrated the forthcoming state visit of French President Albert Lebrun and his wife, following the successful trip to Paris of King George VI and Queen Elizabeth the previous year. An article in this issue described the official functions that awaited them – a gala night at the Royal Opera House, in which Margot Fonteyn was to appear, and a state luncheon at Windsor Castle, amongst others. 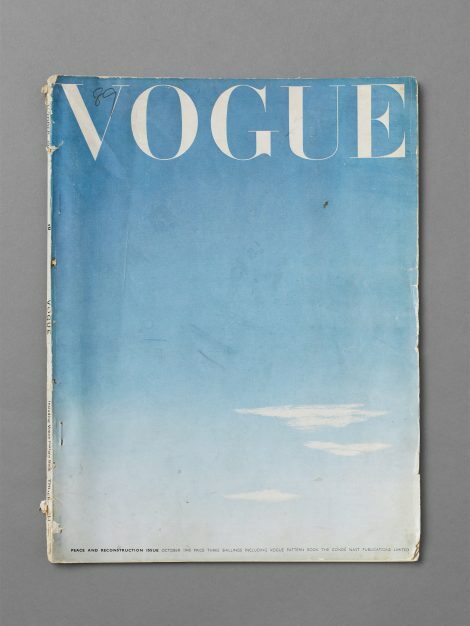 This cover, and that of October 1945 (see ‘Related Items’), mark the end of the golden age of graphic Vogue cover designs. While they continued to be used to some extent, photographic images, appearing from 1932 and also of great quality, became increasingly dominant.